Inviting three-bedroom, four-bath condominium on the 14th floor of Phoenix West is ready to make vacation memories to last a lifetime. The condo, with tile throughout, sleeps 12. Living room features a Queen sofa sleeper, additional couch, two armchairs, and a large flat-screen TV. Fresh Paint throughout condo, new wood-look tile in all bedrooms, new artwork, new furniture and custom drapes, over 26K in upgrades. Kitchen features Corian countertops and soft white cabinetry. There is even a large breakfast bar with five, high-backed seats. Overlooking the Gulf through floor-to-ceiling glass windows, a modern style is highlighted in the dining area with a large wood table that can seat 8. Come see this one today! 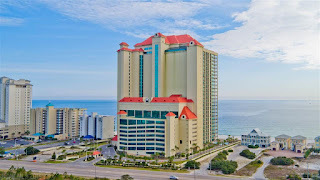 Phoenix West gulf-front condos in Orange Beach are located on the white, sandy beaches of Alabama's Gulf Coast; the community is among the nicest complexes on the Gulf of Mexico, offering spacious, luxurious resort homes with an array of resort-style amenities, making it a popular family vacation destination. Also visit: Phoenix West II Condo Sales.